A human-machine interface (HMI) is a user interface for mechanical systems, vehicles, or industrial installations. 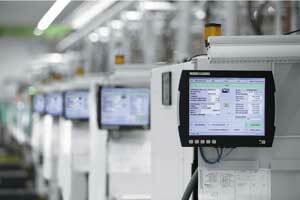 The HMI specifically handles the interaction between operator and machine. They can be local to a particular piece of equipment or device, or they can interface between multiple machines or devices (linked by a host control system) and users. Examples include industrial control panels and machinery controls, as well as touchscreens, keypads, switches and software for controlling equipment. These devices ensure effective control and operation of a machine by its human operator. They also collect information to aid operators in decision-making. HMI design is generally oriented around ergonomics, psychology, computer science, and related fields that support self-explanatory, efficient, and enjoyable machine operation with minimal negative outputs.